About the Bank History: The Bank, founded on 23rd Sept. 1931, is a pioneer in introducing new and innovative trend setting products, tailor made to the diverse needs of varied clientele. Vijaya Bank completed its platinum jubilee in the year 2006. The total business crossed Rs.2.79 lakh Crore as at June 2018 in congruence with the Bank's Mission, "To emerge as a Prime Bank driven by modern technology in meeting customer aspirations, offering professional financial services and contributing to sustained national development." 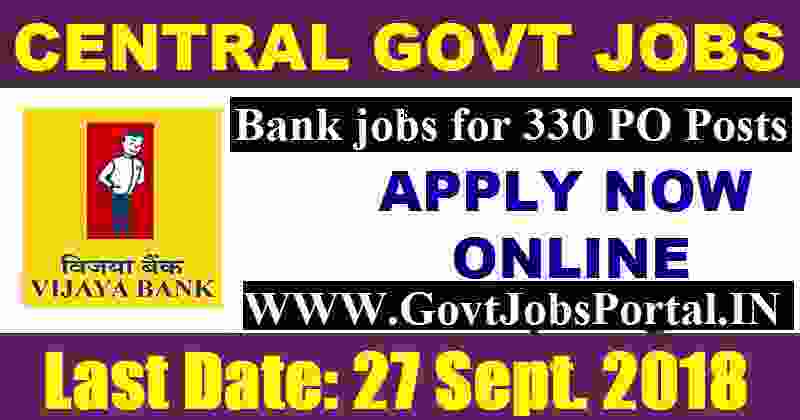 The Bank invites bank job applications (On-Line only) for the Bank PO recruitment for the post of ‘Probationary Asst. Manager (Credit) in JMG Scale-I in General Banking stream. More information related to this Vijaya Bank PO Recruitment 2018 is given below in this article. Candidates selected for the above post will have to undergo a specially designed course through an institute selected by the Bank. · The course will be for a duration of 3 months. · The course is residential and the selected candidates should necessarily stay in the campus. · During the course candidates will be paid a stipend of Rs. 15,000/- p.m.
· At the end of the course an exit test will be conducted. Only, those candidates who pass the exit test by scoring the cut off marks as decided by the Bank will be offered appointment in the Bank as “Probationary Asst. Manager (Credit) in JMG Scale – I in General Banking Stream”. Further, those candidates who do not pass the exit test will not be offered appointment in the Bank. 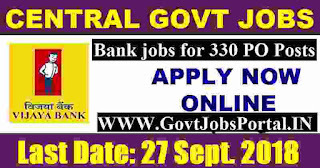 All eligible candidates can apply ON-LINE through link given in our Bank’s website www.vijayabank.com. No other means/mode of application will be accepted. Please read this advertisement carefully and ensure your eligibility before paying fees/submitting online application. Pay Band: Rs.15,000 per Month. Education Qualification: Those who have a Degree (Graduation) in any stream/discipline with minimum arks of 60% marks in an aggregate AND must have competed MBA/PGDBM/PGDM/PGBM/PGDBA – (with specialization in Finance) – through full time course from a reputed university of India/ those who have a Post-graduation degree in Commerce/ Science /Economics/Law can also apply these Bank Jobs in India. All applicants who lies in between above age criteria can apply these bank jobs. Paying Method for Application fee: You can pay the above application fee which we mentioned in the table through an online method. Various method for payment of application fee are: “Debit Card, Credit Card, Net Banking”. 12TH Sept. 2018 is the Opening Date to apply. 27th Sept. 2018 is the Last Date to apply.